Sailor Moon Crystal Set 1 is Available! VIZ Media, LLC (VIZ Media), a premier company in the fields of publishing, animation distribution, and global entertainment licensing, thrills anime fans and legions of aspiring interstellar guardians with the home media release of SAILOR MOON CRYSTAL SET 1. SAILOR MOON CRYSTAL SET 1 is available as a special Limited Edition Blu-ray/DVD Combo Pack as well as a multi-disc Standard Edition DVD Set and Standard Edition Blu-ray/DVD Combo Pack. The SAILOR MOON CRYSTAL SET 1 Limited Edition Blu-ray/DVD Combo Pack carries an MSRP of $79.99 U.S. / $99.99 CAN (Standard Edition $69.99 U.S. / $81.99 CAN); the Standard Edition DVD carries an MSRP of $39.99 U.S. / $51.99 CAN. With these new home media releases, audiences can enjoy the action of the first 14 episodes of the acclaimed reboot of the classic anime series based on Naoko Takeuchi’s original Sailor Moon manga series along with a host of notable bonus features. 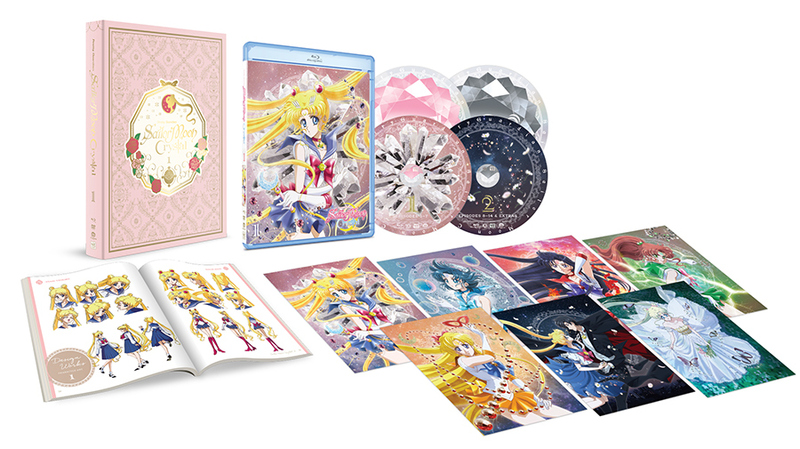 The SAILOR MOON CRYSTAL SET 1 Limited Edition Blu-ray/DVD Combo Pack contains a deluxe, 4-disc collection (two DVDs & two Blu-rays), packaged with an exclusive chipboard box with specialty printing. The LE Combo Pack also contains seven full-color collectible art cards and a premium 88-page full-color art booklet featuring episode summaries, exclusive interviews, character settings and more. Blu-ray bonus content includes series trailers, a digital art gallery and a special “Introduction to SAILOR MOON CRYSTAL” featurette with the English voice actors. Blu-ray episodes are presented in 1080p HD video format from the Japanese home video masters. The SAILOR MOON CRYSTAL SET 1 Standard DVD Set features four discs with beautifully illustrated variant O-card packaging and specialty foil printing. Episodes will be presented in 480p standard video format. How many of you will be checking out this new release? Next Post:The Snatcher Soundtrack is Coming to Vinyl!